This article first appeared in Options, The Edge Malaysia Weekly, on April 17, 2017 - April 23, 2017. Known for her impeccable sense of style, talent and charm, the ageless Plum Sykes has added a delicious new twist to her writing repertoire. Synonymous with American Vogue as one of its beloved, long-time contributing editors, Plum Sykes has come a long way, literally, since she was plucked from her native England as a young journalist for a covetable position at the fashion bible helmed by the legendary Anna Wintour. “I was working at British Vogue. In fact, it was my first job, which I got by going there for work experience, and after I had worked there for about four years, I got offered a job at American Vogue,” she says. Life these days for Sykes — whose real name is Victoria but her nickname, Plum, in reference to the Victoria plum fruit found in England, stuck with her — revolves around her two cherubs, Ursula, 10, and Tess, 6, and Toby Rowlands, her husband of over a decade. The family leads an idyllic existence in the English countryside, on what Sykes calls “a remote sheep farm in the Cotswold Hills”. In reality, it is a wildly beautiful and stone-clad country home built around an old cottage that nestles in 100 acres of pastureland in pretty Gloucestershire. It is easy to imagine Sykes in that exact room, penning her latest book that is to be launched on June 1 by Bloomsbury. Sykes says Party Girls Die in Pearls is the first of a new series and that there will be a few of them going forward. How difficult was it to write a murder mystery, even for someone who had read plenty of Agatha Christie and P.D. James growing up? “It was a really big challenge at first. I kept wondering if I was going to be able to pull it off and if everyone was going to guess who did it. But no one seems to guess until right to the end when I tell you who did it,” she says. She believes a murder mystery gives the book a good spine to structure a story around and, in a way, makes it much simpler to maintain the narrative and keep it flowing. Party Girls Die in Pearls is set in Oxford, one of Sykes’ favourite places in England, besides London and the Cotswolds. Like her, her father and grandfather, Christopher Sykes — official biographer of the novelist Evelyn Waugh and son of diplomat Sir Mark Sykes — were also educated at Oxford. But Sykes did get into Oxford, where she read modern history, thanks to her love of “stories, people who told stories and the stories in British history” and the influence of Our Island Story, a famous English history book for children. Sykes’ response when reminded of Wintour’s praise reveals her no-nonsense side. “You have to work really hard if you work at American Vogue. You can’t get away with not. What does she consider stylish, being the arbiter of style herself? “I think really stylish people are not necessarily wearing the most fashionable clothes. They definitely have a look that is unique to them. Dita Von Teese doesn’t look at all on trend but she looks incredibly glamorous and chic in what she’s wearing. Isabella Blow, whom I worked for at British Vogue, had an extreme sense of style. I think having your own taste is a stylish thing to have. After her marriage in 2005 to British entrepreneur Toby Rowlands — who had gone to Oxford at the same time as her but who she did not meet until at a wedding in their early thirties — Sykes has lived in England. Though not easy due to the time factor, she manages to juggle motherhood with work, something she intends to continue doing. Though born in London, Sykes grew up mostly in the country — a childhood of riding ponies and going on long country walks. She says, “I was very much an observant child and would remain on the fringes of situations, on the outside looking in like a writer. When I moved to America, I was an English writer in New York and I was very much able to observe from the outside.” This, plus a love of reading and creative writing as a child, inevitably guided Sykes into a long-term writing career, contributing to American Vogue on topics of fashion, celebrity and society, apart from authoring her own books. 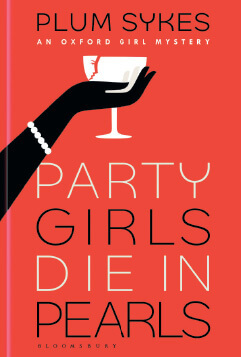 As a proof copy of Party Girls Die in Pearls reveals, Sykes’ knack for life-meets-art storytelling in her signature prose and seamless integration of fact and fiction promises continued top-notch entertainment.